I've been trying to get nice open crumb in my bread for a while now. This represents the best I've achieved so far, I'm not unhappy with it, but there are a couple of things I would like to ask. I'll first go through my method though. I skipped the poolish phase because I didn't have the time today (I normally include it). Autolysed water + flour for 10 mins, added yeast, mix for a few minutes in stand mixer, added salt, mixed more (total about 10 minutes mixing time). Bulk ferment for 3h30mn, it grew about 2.5-3x in size, finger poke test showed it wasn't over proofed (indentation filled back slowly). Stretch & folded 4x letterbox method, then divided into 2, shaped into boules, placed on parchment paper and let rise for final proof. Let boule rise for just under 3h before putting in preheated dutch oven and baking (20mn covered, 40 uncovered). I messed up the scoring by doing it too slowly and probably a bit too deeply, so I got a flat, unpronounced scar. Was my dough over proofed? It did rise in the oven, so I'm thinking no, but I would like a second opinion as I'm not too familiar with this yet. Why did all the big bubbles appear at the top of the boule? How do I know if I'm scoring too deeply, or too shallow? For a more open structure use more water (or milk), Try for 70% to 75% hydration. The dough will be sticky, but you can still knead (or stretch & fold) by lightly dusting it with flour. 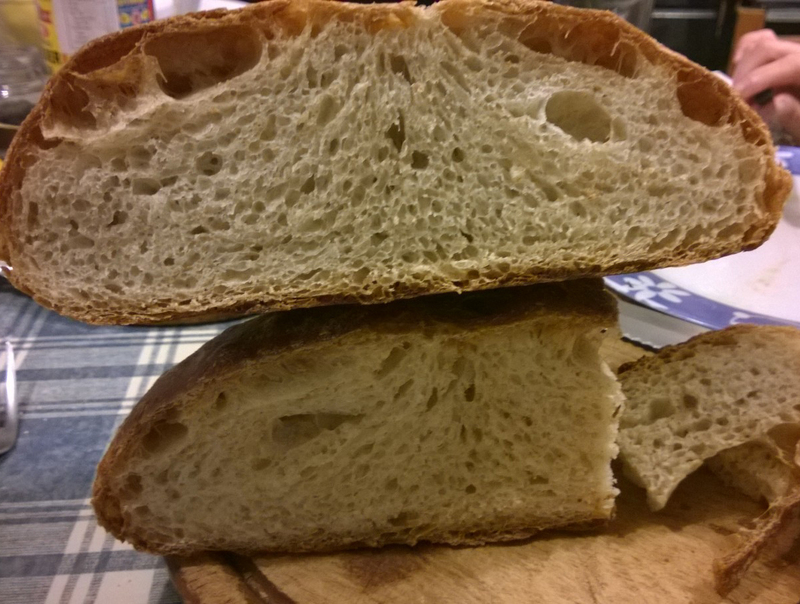 The large holes are probably due to occluded air formed during the shaping process of the loaf. I do a 65 % Hydration and do the Stretch and Fold 6 times over a period of 3 hours, degase ever so gently and shape with a light hand. I do the Stretch and fold in the bowl and also let it have the first rise in the bowl without taking it out to put it in another bowl with oile and all that. I find, the less I disturb the dough the better the crumb will be. Also , I would recomend , to use a Dutsch Oven. Bake the first 30 minutes with the lid on on highes setting, than 20 Minutes with the heat turned down and no lid for a beautiful golden brown crust. That is a good technique to knead and not be too rough after or during the bulk fermentation. I've used this also. I would still recommend a higher hydration. A good technique is always whatever works for you. I tried the 70% and 75% Hydration but my loaf did not rise very well even so I used the same Temperatures and times in the Dutch Oven and basically all the same techniques. Also the crumb was not as nice as with the 60% and 65% Hydration. It might well be the the recipe. I make my Leaven the Night before with 20% of the Flour I use in the Recipe. I use 450g of Strong Bread Flour and 50g of Wholemeal Flour, so the Leaven is made with 1 Tbsp of a 120% Hydration Rye Starter and 45g of Strong Bread Flour, 5g of Wholemeal Flour and 50g warm water. I put the Leaven in the fridge overnight and then take it out the next day and leave it for another 2 hours, than I start making the dough.... Ready to bake in the Evening OR the next day when I want a tangier taste. The Crumb is much more open nicer in the mouth with the lower hydration because of the better rise during baking. When I do my white bread * enhanced with Sourdough Starter * I use the higher Hydration. First off let's start by saying it looks quite nice. I think for such a large quantity of commercial yeast the proofing times are a bit long. And the openings near the roof are signs of a bit overproofing in my opinion. From the look of the rest of the loaf I'd say not very much. Slashing just takes some practice but external looks should come second to flavor and structure. I'd strongly suggest using the preferment which will allow you to use less overall yeast. 1% yeast is pretty standard in a straight dough that ferments rather quickly. 3 1/2 hours seems a bit much for this amount of yeast. Again 3 hours is a bit long for the final proof as well. I'd think a dough like such would be more like 1 - 1 1/2 hours during the bulk and about the same for the final rise. Of course this all relative to the temp of the dough. But if your using standard temps in the 70s that's what this formula implies. To develop more flavor I'd suggest pre-fermenting 20% of the flour in a poolish as you already have been with just a pinch of yeast in the poolish. let this rise overnight (12 hours). Then decrease the overall yeast to about .5% percent and decrease your timings some. Maybe a 2- 2 1/2 hour bulk with 3 folds @ 30 minute intervals. Then divide preshape rest.shape and then 1 1/2 - 2 hour final rise. Watch the dough not the clock. Along with that I suggest a longer autolyse (at least 20 minutes). Of course increased hydration will help open the crumb but I think you have timing/formula tweaks that are more important to adjust. I'll incorporate those suggestions the next time. I have the other half of the dough in the freezer, so we'll see how it turns out next week. I do have one more question though. How does one know when the bulk ferment is done, and does it really matter if the bulk ferment is slightly over proofed? It really depends on the formula and process. But with a yeasted dough generally speaking bulk fermentation is complete upon the dough doubling in volume. With naturally levained dough this is a bit different and usually but not always somewhere around 30-50% increase in volume. Again the formula and desired results come in to play. Dough gains strength from physical manipulation and through fermentation (hence the no-knead bread phenom). If you let your dough ferment too much at this state you will bring too much strength to your dough. Too much strength will make for a finer crumb, less appealing texture, difficulty handling, and potentially hurt the flavor profile. Also you will be depleting the food source for the remainder of the fermentation cycle. Oh, and would inverting the loaf just before baking help with more even distribution of the larger air bubbles? 1 Tbsp Sourdough Starter, 45g of Bread flour, 5g whole meal Flour, 50g Water. I do stretch and fold in the dough 6 times over 3 hours, than rise for 4 hours and than proof for 2 hours and bake in a Dutch oven. Gives a great open crumb and a cood crust. For me it is the wetter dough and the less kneading but just stretching and folding of the dough in the bowl with 30 minutes of resting between stretches and folds that did the trick. Also I do not let the bread proof for long, only 2 hours, so it has a lot of spring in the Dutch Oven. Thanks for your information it looks like a really good fail-safe recipe. When you say "I do stretch and fold 6 times over 3 hours" do you mean you do one S and F each of 6 times over three hours or do you do several S and F each time depending on the "feel " of the dough? Sorry if it's a daft question but sometimes I feel I'm working the dough too much. Once I mixed the dough in the bowl * not kneading * I add the Salt on top, cover with Plastic wrap , wait 30 minutes and do my first S &F in the Bowl, cover with Plastic wrap again, wait 30 minutes, do the next S & F, cover with Plastic wrap and wait 30 minutes..... I do this until I had 6 S & F * always in the bowl. After the last S & F I cover again with Plastic wrap and wait until the dough has risen to about double in Volume, then I degase the dough very gently and gently form a boule and put it in a well floured Banneton to give it the final rise. If I am not to greedy I let it rise in the fridge over night for the first rise, that gives a wonderful flavour, but most times my family already sits with Butter and knife at the table waiting for the bread lol. Great advice. Many thanks. I suspected that sometimes I've been doing too many S and F and it seemed to me with some recipes that the dough was getting slacker and wetter. Other times it all goes like a dream perhaps depending on the flour. Well, the more wet the dough the better the loaf and the crumb, but I never go over a 65% Hydration. Which means , with the recipe given it would be 350 ml warm water, or just do 60% Hydration which would be 300ml. I do my S & F's in the bowl and leave the dough in there for the first rise too so I do not disturb the dough to much. After the first rise I gently take the dough out of the bowl , degase it gently and also gently shape it into a boule and put it in the Banneton for the final rise. What I found is, that with a Dutsch Oven , the crumbs develops so much nicer and is more open than baking on a baking stone and spraying water ever so often. I bake my bread on higest heat with the lid ON and then reduce the heat somewhat and open and take the lid off so that the crust gets goldn brown and wonderful crusty. Thanks Petra for your helpful comments. I, too , use a Dutch oven, high heat, and remove lid after 20 minutes. I see that you treat the dough very gently, which I like very much. One further question if I may, in view of that, when you speak of "mixing" is this just a gentle mixing to bring to what people call a "shaggy mass" or do you mix to a medium gluten point?